The disappointing long-term survival for non-small-cell (NSCLC) and small-cell (SCLC) lung cancers has highlighted the need for additional strategies. The modest activity of therapies targetting epidermal growth factor receptor (EGFR) suggests that other targeted therapies such as immunotherapy are worthy of consideration. Several recent reviews have addressed this topic (1,2). Although renal cell carcinoma and melanoma are the classic targets for immunotherapy, attempts to activate the immune system against lung cancer have actually been ongoing for 30 yr or more. The initial approaches used bacterial cell wall products to cause a profound, but nonspecific, inflammatory response. Occasional studies demonstrated clinical benefit, and some of these agents are still being tested. Modern theories regarding the role of antigen-specific immune response, though, have given greater impetus to develop vaccines that activate immune responses against specific tumor antigens. 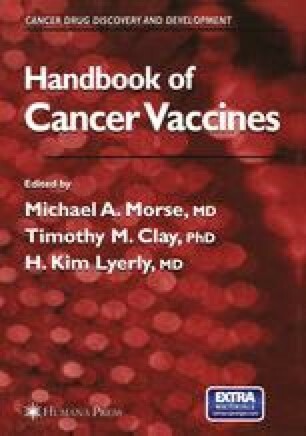 This chapter will focus on the role of vaccines to activate immune responses against lung cancers.